Pothole filled with water for weeks. Continued erosion is happening over time. Thank you for submitting your service request (SR #18-00706087). You will receive an email when your request has been addressed by the servicing agency (DDOT). Thank you for submitting your service request (SR #18-00706080). You will receive an email when your request has been addressed by the servicing agency (DDOT). Thank you for submitting your service request (SR #18-00660350). You will receive an email when your request has been addressed by the servicing agency (DDOT). Thank you for submitting your service request (SR #18-00628703). You will receive an email when your request has been addressed by the servicing agency (DDOT). Thank you for submitting your service request (SR #18-00627543). You will receive an email when your request has been addressed by the servicing agency (DDOT). Thank you for submitting your service request (SR #18-00436502). You will receive an email when your request has been addressed by the servicing agency (DDOT). Thank you for submitting your service request (SR #18-00607201). You will receive an email when your request has been addressed by the servicing agency (DDOT). PEDESTRIANS COMING OFF THE 64 FT TOTTEN BUSES AT 4TH AND NEW HAMPSHIRE, NW CANNOT CROSS THE STREET AT A PEDESTRIAN CROSSWALK BECAUSE CARS COMING FROM NORTH AND SOUTH ON NEW HAMPSHIRE AVENUE WILL NOT STOP TO LET PEDESTRIANS CROSS. THIS IS ALSO THE CASE WITH THE METRO POLICE DEPT WHO ALSO WOULD NOT STOP AT THE PEDESTRIAN CROSS WALK ACROSS NEW HAMPSHIRE AVE NW. AS SOON AS SOME ONE GETS RUN OVER I ASSUME THE CITY WILL FINALLY STEP UP AND DO SOMETHING ABOUT DC TRAFFIC LAWS BEING VIOLATED CONSTANTLY AT PEDESTRIAN CROSS WALKS. THE LAW SAYS THAT THOSE WHITE LINES ON THE STREET MEAN A PEDESTRIAN HAS THE RIGHT TO CROSS SAFELY. THIS LAW IS NOT ADHERED TO IN THE DISTRICT AND THE POLICE DEPT DO NOT ACKNOWLEDGE IT EITHER. 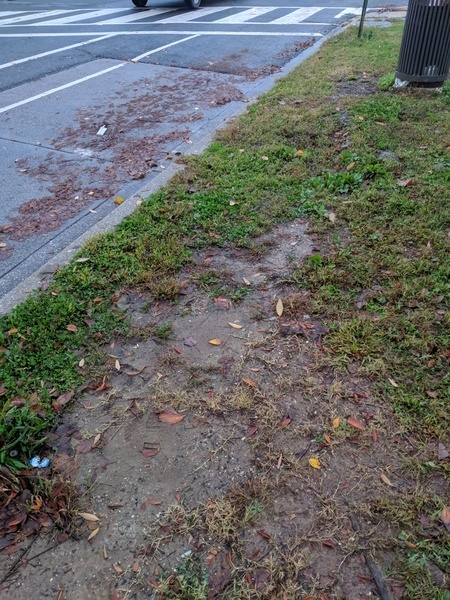 THIS IS MY SECOND REQUEST OF THIS PROBLEM AND I AM KEEPING RECORD OF MY NOTIFICATION TO CITY OFFICIALS BECAUSE WHEN SOMEONE GETS RUN OVER AT THIS CROSS WALK I AM GOING ON LOCAL NEWS STATIONS TO COMPLAIN. Imposible to turn either way onto new Hampshire from Crittenden here due to cars parked too close to the intersection on New Hampshire. Need to remove parking or add a light. Thank you for submitting your service request (SR #18-00573488). You will receive an email when your request has been addressed by the servicing agency (DDOT).